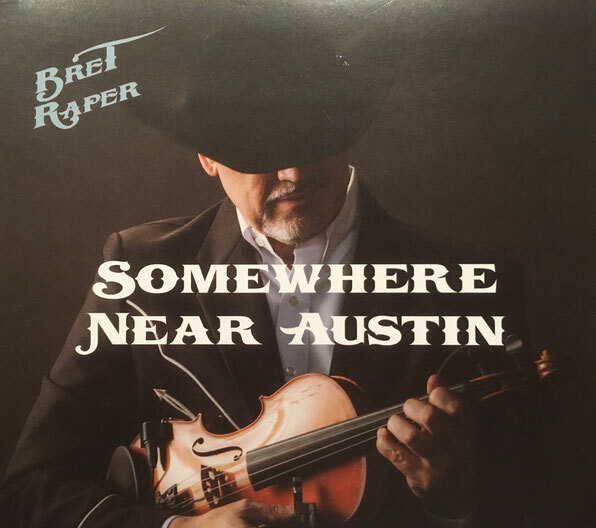 New Review Mike Gross "Bret Raper - Somewhere Near Austin"
Fiddle, acoustic guitar and piano player Bret Raper has just issued a fantastic Western Swing album that he co-produced, consisting of 12 very enjoyable tunes. Many other musicians also participated to create this gem. Others are Rob Hajacos, also on fiddle, the steel guitars of Gary Carter, Robby Turner and the great Doug Jernigan and also on piano are Scott Todd, Craig Brenner and Robby Turner. The album bass players are Rick Ferguson, Jimmy Carter and Kevin Grant. The drummers are Dan Jackson, Lonnie Wilson, Brian Fuller and Zachery Todd. The acoustic guitarists are James Mitchell, Danny Parks and Tyler Parker. James and Danny also join the great Gregg Galbraith on lead guitars. Beside Bret on piano, we also hear Scott Todd, Craig Brenner and Robby Turner while Tobin Wingard plays harmonica. The background vocalists are Pam Waterford, Gordon Lowry, Libby Lowry and Dave Matney. The album opens from the Bob Wills song book with Lloyd Wood singing Cherokee Maiden. Others from the Bob Wills hit parade are San Antonio Rose, Roly Poly, Faded Love and Cindy Walker's Sugar Moon. Borrowed from Ray Price is One Fiddle, Two Fiddles and from the pen of legendary DJ, Bill Mack is Drinking Champagne. Borrowed from country music is the Patsy Cline memory, Walking After Midnight and from Tracy Byrd, Back in the Swing of Things. Kyle Strauser brings back Kokomo Arnold's Milk Cow Blues from the Johnnie Lee Wills library and also remembered are two instrumentals, Westphalia Waltz and Orange Blossom Special. The vocalists are wonderful and in addition to the two already mentioned Hannah Williamson and Ernie Rowell each do two of the vocals while others are sung by Angela Parker, Greg Parker and Amber Martin.